Dusk shines just the right light on one of the world’s most exclusive showrooms. The first time I had more than an inkling that there existed an entire world outside of my own experience was during my freshman year in college. My friend’s roommate, to put it politely, “came from money,” and where I had plastered the walls of my dorm room with posters for movies and rock bands, he plastered his with framed blow-ups of Ferraris. Not just any Ferraris, mind you, but the Ferraris owned by his family. “It’s a different world,” I remember thinking to myself. But, wow, those cars were cool. It’s the car as star from all vantage points. 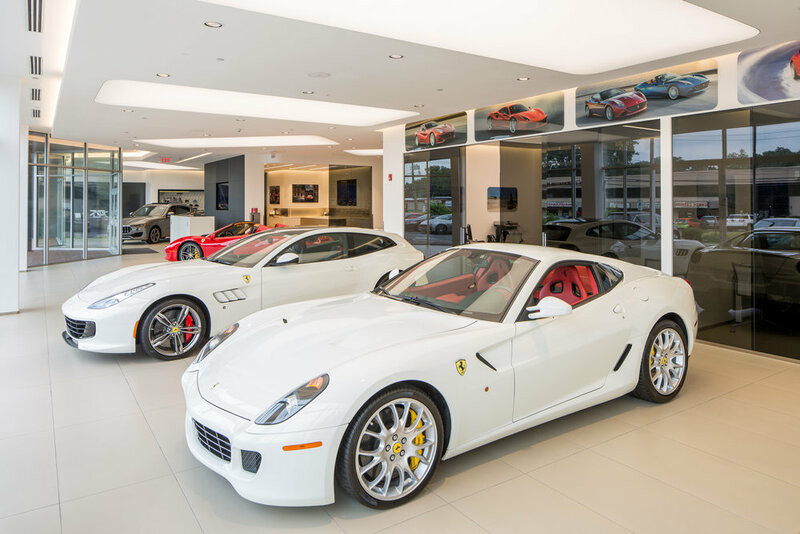 I still get that feeling when I’m assigned to photograph a building, home, retail space, showroom—anyplace really—that unabashedly proclaims “luxury.” Such was the case when I first stepped inside Wide World Ferrari-Maserati in Spring Valley, New York. 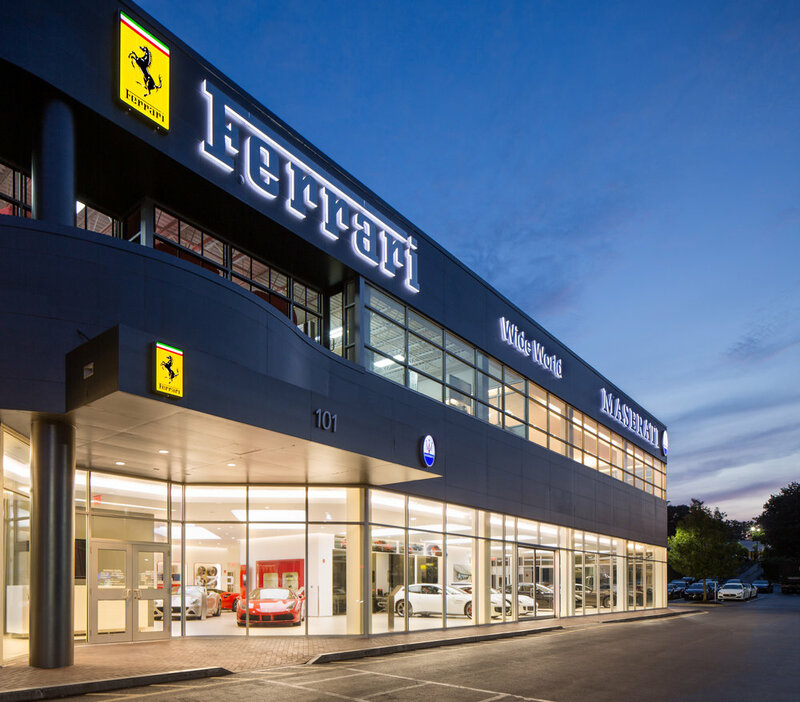 Everything about Wide World reflects world class performance, design and service—exactly what someone in the market for a Ferrari would expect. Customization and personalization start here. New Country Motor Car Group, the dealership’s owner, and Penney Design Group, the architects, hired me to photograph the building as well as document the physical spaces through which a buyer is escorted along the “path to purchase.” Every step of the way—from selecting seats, steering wheel and rim designs to choosing interior colors and fabrics—is a ritual in itself. All of which builds to the creation of a customized high performance car crafted in Italy to the exacting standards of the driver. Lighting is always a critical factor in environments like this and being able to provide our own fill lighting allows us to counter the relative flatness given off by overhead fluorescents. Here, however, we were required to shoot during business hours. So our nimble battery-powered lighting units really came in handy, making it easier to maneuver and light with precision without drawing undue attention or having the potential trip hazard of power cords on the floor. But does it come in red? 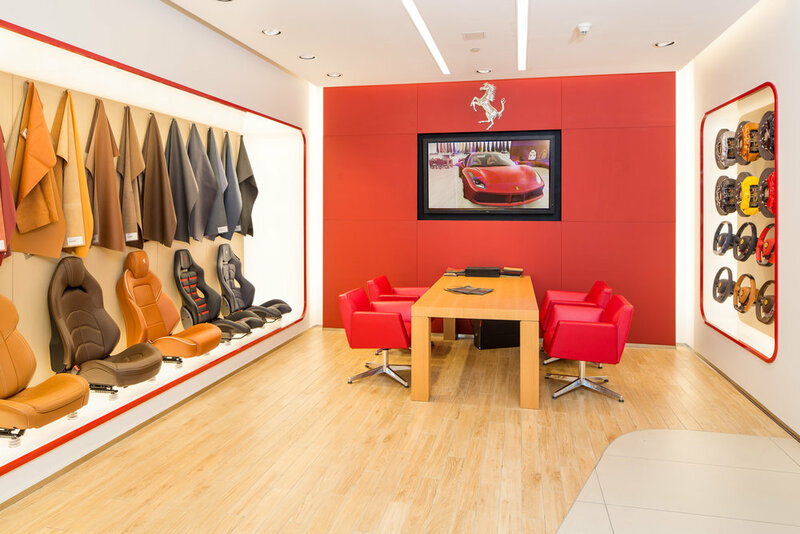 Because personalization is such an integral part of the buying experience and the cars themselves are so expensive, few are actually kept in inventory. So the ones that are here are true showpieces. Which is why every photo we made—from reception area and private consultation rooms to an upstairs promenade and owner’s lounge—features one or more models. In this world, it’s more than just about the cars. But, wow, those cars were cool.